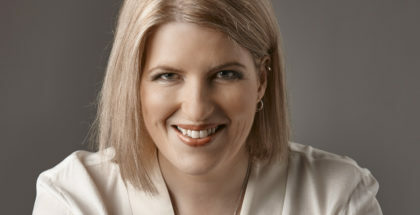 Adventurous Yorkshire jazz artist Clare Teal has been extremely successful. 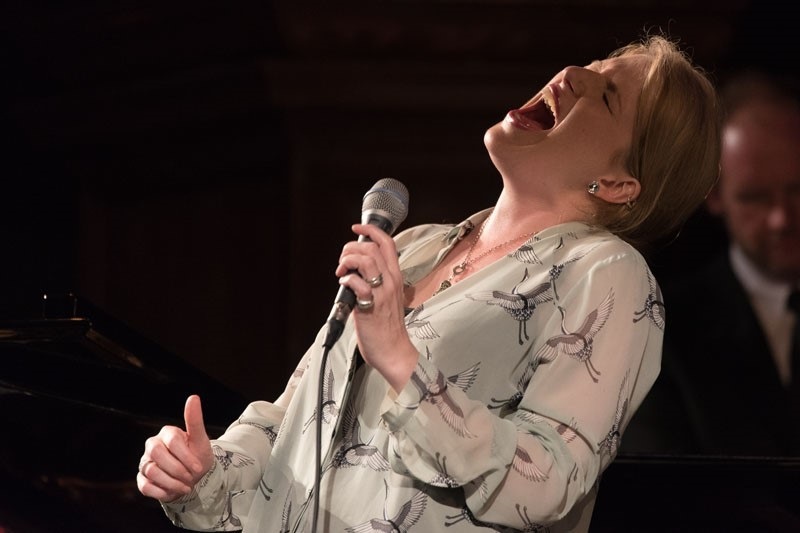 Called ‘The Queen of Swing’, she’s performed with artists like Jamie Cullum and Katie Melua and had many critically acclaimed albums. 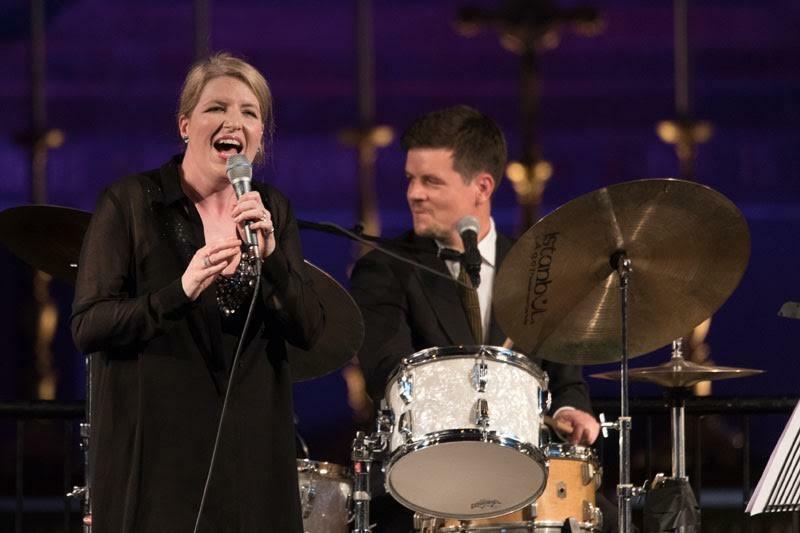 She’s won numerous annual awards and her regular BBC Radio 2 big band programme can be heard regularly on Sunday evenings. At this Proms at St Jude’s evening Clare reinterpreted songs from iconic female jazz singers of the 20th century joined by her seven piece band: Alex Garnet (alto & baritone sax), Paul Booth (tenor sax), Martin Shaw (trumpet), Gordon Campbell (trombone), Ben Reynolds (drums), Mark Hodgson (bass) and Jason Rebello (piano). 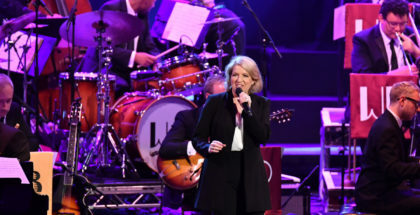 Clare celebrated with ‘Hallelujah’ , the song that Leonard Cohen wrote and struggled with for many years, together with the rhythmical ‘I’ll Be Your Baby Tonight’ by Bob Dylan. She jokingly referred to working with Van Morrison as “like harmonising with mercury”, covering ‘The Way Young Lovers Do’ and ‘Teardrops From My Eyes’ was the upbeat hit that made Ruth Brown famous in rhythm and blues. Ella Fitzgerald‘s ‘Dream A Little Dream Of Me’ was warm and intimate. Peggy Lee‘s ballad ‘The Folks Who Live On The Hill’ sounded tender and there were four timeless and sensual Doris Day songs: ‘Secret Love’ , ‘Shaking The Blues Away’ ‘Perhaps, Perhaps, Perhaps’ and ‘Everybody Loves A Lover’. Written by Harold Arlen were Judy Garland’s ‘Get Happy’, echoing the theme of a Christian evangelical meeting, and ‘That Old Black Magic’, first released by Glenn Miller and here sung with joy and confidence. Clare also sang her personal compositions: the vibrant ‘Messin’ With Fire’, cheerful ‘One More (Baby Be Good To Me)’ and ‘Never Go Away’, the bright and optimistic song she wrote with folk artist Chris While. Throughout the evening Clare was chatty, thoughtful and humorous and her imaginative set list was sung with her rich and silky voice. The wild and cheeky Etta James hit ‘I Just Wanna Make Love To You’ was a wonderful encore, together with Snow Patrol’s ‘Chasing Cars’, apparently her “most requested song in the big apple…Taunton”. So, Clare decided to end on a fine contemporary classic and an earthy Somerset joke! Her songs are a little like West Country cider – carefully matured and fermented with a delicate aroma.